S 500 x 306px 0.5 Mb. XL 4976 x 3050px 15 Mb. 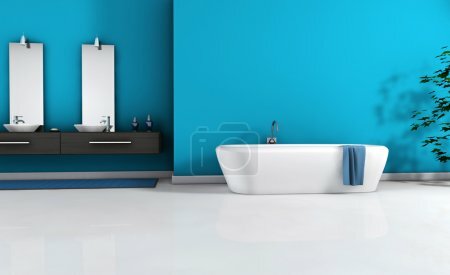 Home interior view of a contemporary bathroom with modern design and furniture and empty space on wall for your copy, colored in blue cyan, black and white floor, 3d rendering.